I don't think there is any excuse to not venture outdoors and get some fresh air into your lungs just because summer is over. 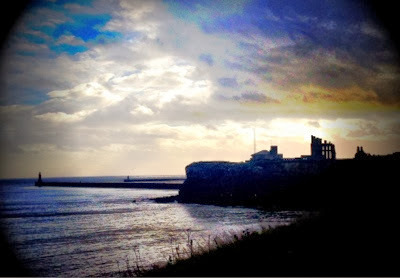 This morning we enjoyed a lovely walk along Tynemouth coast. The kids loved spotting the boats and playing shadow games. 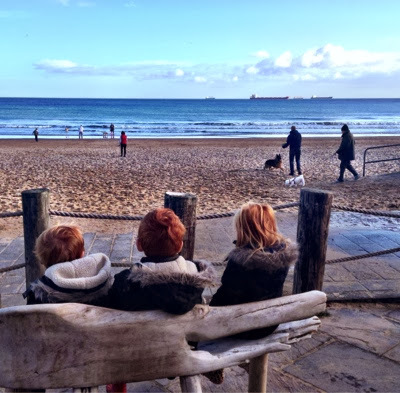 We walked from Tynemouth centre down to crusoes on Tynemouth longsands - there are some fabulous views of the priory and beach along this short toddler friendly walk. We reached the beach at about 9am and it was really busy with fitness fanatics, dog walkers and families. The kids found this to be the perfect spot for a bit of people watching. 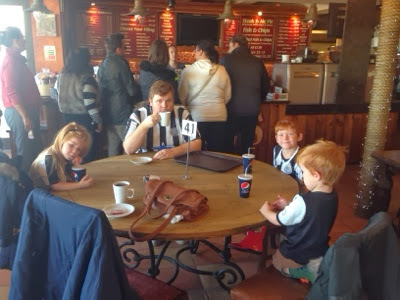 Crusoes is a favourite spot of ours - it was very busy today and I do prefer it mid- week when it is quieter. However we found a table straight away and service was super quick. The atmosphere is unique inside crusoes. I love the large windows allowing a fantastic view of the beach and I love the fairy lights and beach shack decor. The breakfast menu is fantastic! There are 12 types of breakfast sandwich! We are boring and always order the same thing (3 x sausage, 1xsausage and black pudding and 1xdouble egg) but the sandwiches are just simply delicious and the bread is alway super fresh! The homemade cakes and scones are amazing too. I do wish they would invest in a decent coffee machine though as the coffee is always a bit on the bland side and nothing special. It does the job though. After breakfast the kids had a little play on the beach before the rain started so we headed home. 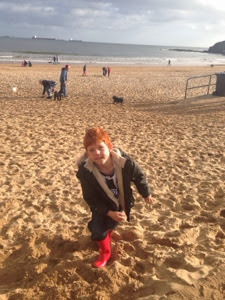 I managed to capture this gorgeous shot of my daughter looking so happy and content just looking out to sea. Made my day.